Top-booked rodeo act performer and multi-species animal trainer Joan Ronalder uses her unique skills to create a special horse for a handicapped rider. from wheelchair to saddle and newfound mobility! For most of us the freedom to go where we wish is a given. We can get up and walk across the room, go into buildings, take hikes in the woods. My good friend Mickey knows no such freedom. Mickey is a young woman who had always been active. Then one day the world changed. She was thrown through a plate glass window and lost one leg above the knee and most of the muscles in the other leg. Forced to use a wheelchair to get around, the dream of having a horse and riding into the sunset seemed lost. She had always wanted to a horse of her own to trail ride with friends and family. Then the miracle happened. Mickey met Joan. Joan is a horse trainer, not just your ordinary show horse trainer but a multi-species trainer whose performances draw top billings across America. To Joan, the realm of possibility is endless. Joan had trained a horse for a young paraplegic doctor a few years before so maybe she could train one for Mickey? Joan had just bought a paint stallion, 6 years old. She didn't really need him but felt the pull to get him anyway. He was a quiet horse, big and strong, but totally untutored. In a discussion the thought came up that maybe Mickey should see this horse. It was love at first sight. Mickey loved the big sorrel paint and Pawnee seemed to recognize that this was what he had been born to do. He walked to this pretty lady in the wheelchair and put his head down into her lap to be petted. There wasn't a dry eye in the place as we all realized why Joan had bought Pawnee. Mickey and Joan agreed on the details and Pawnee started on the road to being an assistance horse. You see, Joan doesn't just teach horses to be nice so the handicapped can ride them, she teaches them to lie down next to the wheelchair so a handicapped rider can mount independently. The indignity of being put on a horse, needing a ramp, having to be placed in a hoist is not for Joan's students. They can mount, dismount for a picnic or a rest, and then get back on the horse anywhere, and be truly free and self-reliant. Assistance horses need to be taught to overcome the horse's natural fear of being approached by a moving object (the wheelchair). They then have to accept someone getting on them while they are lying down. The horse needs to lie down readily on command, stay down and very still while the rider mounts, which goes against his every instinct. Then he must get up very gently so the rider isn't unseated (not especially easy for the prone horse who has never had to arise from anything but a good roll) and above all, he must be a gentle and well-trained pleasure mount. The horse also has to learn to stand motionless while the wheelchair-bound person dismounts, untacks the horse, and grooms him. Pawnee can even be easily and safely led from a wheelchair. This training takes about 3 months. Naturally, Joan teaches the rider to manage the horse safely. From breeding stallion to assistance horse is quite a transition. And, yes, he is no longer a breeding stallion. For ultimate safety he was gelded after the initial training. The joy that shines from Mickey's face as her horse rises up and carries her where she wants to go is amazing. The bond between these two is touching as Pawnee gently nuzzles his person and Mickey kisses her horse. Four legs are better than two and as Mickey says " Now we have five legs." 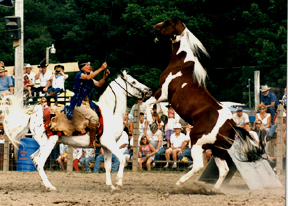 For more information see Joan Ronalder, Multi-Species Trainer, whose “top billing” rodeo, theme park and horse show acts have entertained audiences from Arizona to Canada!